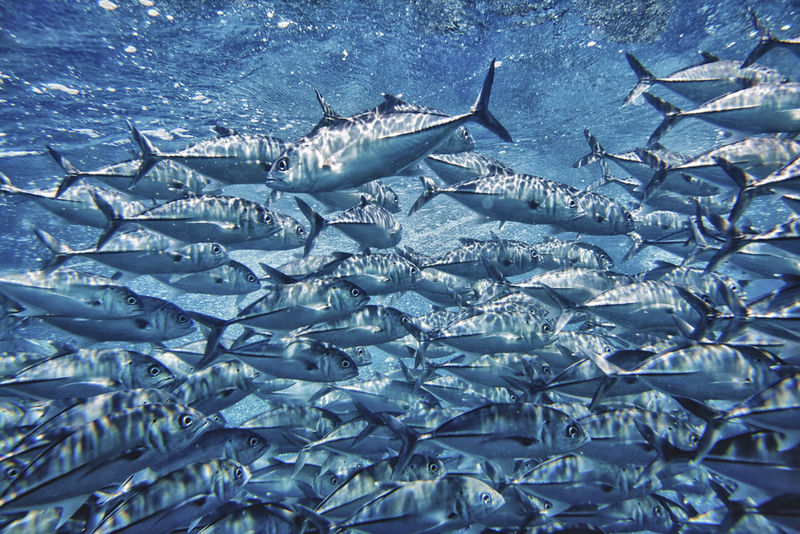 A school of tuna swims through the ocean. Many ocean activists say that tuna should be on the Endangered Species List. Others urge that tuna should be limited or removed from one’s diet, largely due to its high mercury content. Fish have always been upheld as a healthy, low-fat alternative to beef and pork. Many varieties, particularly small and oily fish (e.g., herring, sardines, Atlantic mackerel), are high in omega-3 fatty acids like EPA and DHA, which are essential fats that cannot be synthesized by humans. Read about the 8 Healthiest fish to eat. Though fish intake has leveled out as a whole in the United States, the FAO reports that the consumption of fish has expanded globally over 4 percent in 2010 to $218BN annually despite the fact that over 80 percent of our world’s fish stocks have been fully exploited. Those of us who are sushi lovers often find ourselves eating fish more than average. Learn how to make fish stock from the whole fish. Anyone who consumes fish needs to not only take into account depleted fish stocks, but also contaminant risk, such as mercury and PCBs. Now that more studies have linked mercury, a known neurotoxin, to adverse health affects ranging from lethargy to hair loss in adults to even more severe damage in children, consumers are becoming more informed on how and what they consume. According to the EPA, The U.S. is estimated as the third highest producer of anthropogenic mercury emissions, but that’s only a small portion of the global emissions. Asia produces about 53% of the mercury emissions and approximately half of the mercury deposits in the United States are from atmospheric deposits from Asia. What to eat when at a sushi restaurant. “Mercury clears from the body very quickly,” asserts Fitzgerald, “especially compared to other toxins like PCBs and dioxins, which can stay in the body for decades. One estimate that I saw is at a rate of 1 percent/day if you are not taking in any more mercury. That means on average you can get rid of 50% of your mercury load in 2 months.” But this of course is if you don’t continue to recontaminate your body by eating more fish, cautions Hightower. What’s clear now is that every fish has mercury and with forty-four states with fish advisories, it is imperative for people to reconsider their consumption patterns. The latest findings from the Environmental Health Perspectives report also reveals that mean mercury concentrations in the Food and Drug Administration’s Monitoring Program guidelines differ by 20 percent or more for 33 out of 58 seafood items, putting more people at greater risk for exposure. Download the Seafood Watch app or visit the EDF site to make sure you are not putting you or your family at risk.